American toys were originally made in the home, but by 1750, artisans who specialized in making toys were established in Boston, New York, Philadelphia, Baltimore, Charleston, and other cities. From the 1830s onward, commercial mass production of toys was a flourishing industry in the United States. The rocking horse, or hobbyhorse, has survived in many versions. This nineteenth-century example is made of pine painted with oil colors. The two parallel rockers are each cut in profile from a single piece of wood. The actual form of the horse is incidental in this case: a horse's head and neck, cut in profile, are attached to the forward end of the rocker. The harness and ears are leather and fastened on with tacks. This rocking horse is essentially a low-back Windsor chair with splayed legs fastened to a rocking platform; since the chair is more complex than the horse, it is possible that the craftsman was a chair maker by trade. A true rocking horse, this piece is primitive in construction, yet its design is vigorous and spirited. The stylized, round body is actually a single wooden log, while the head and neck are carved from another single block. the flat, stick legs are mortised into the underside of the body. The horse is mounted on a pair of rockers. This rocking horse was made between 1853 and 1856 by Benjamin P. Crandall of New York City; his name appears on the under surface of the horse. 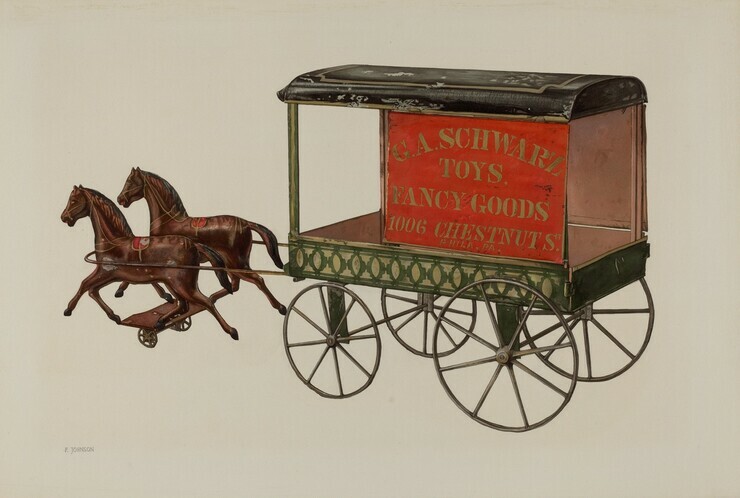 Like many other toy makers, Crandall did not produce toys exclusively and was listed also as a carpenter and maker of wagons, carriages, and perambulators. This small horse -- only twelve inches high -- could not have been a hobbyhorse, but it was a delightful toy in the hobbyhorse style. Made about 1835 in Pennsylvania, it was carved from a single piece of pine. The eyes, nostrils, hooves, and horns are painted. Iron nails driven into the top of the neck keep a horizontal crack from opening further. Pull toys, set on wheels, provided animation to heighten a child's pleasure. Pull toys were frequently made of wood, as in this streetcar model of about 1885. 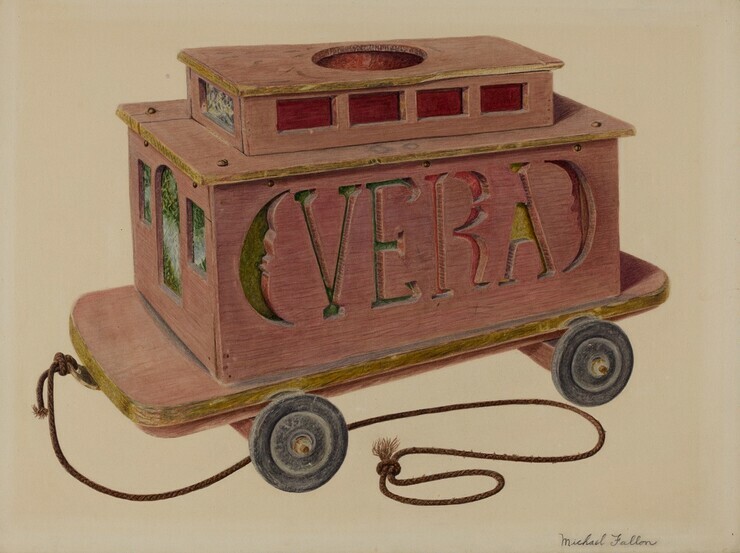 Inscribed with the owner's name, Vera, this handmade toy is of pine. The sides have sawn-out decorations of crescents, and the windows of the ends and cupola are backed with colored glass. There is a hole on top to insert a candle. Another pull toy is this dachshund of about 1880. Loosely jointed, it undoubtedly once had wheels under the legs so that it could move along a flat surface with its body undulating from side to side. Constantly seeking ways of adding animation and novelty to their products, toy makers invented many ingenious products. Pennsylvannia German artists were especially creative in this respect. 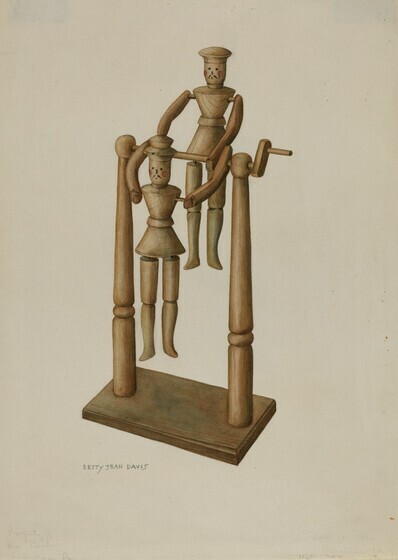 The hand-operated wooden toy shown here consists of two jointed figures that revolve around a pole when the handle is turned. Made about 1835, the toy is hand-carved of pine. The wood has a natural finish, but the features are tinted. 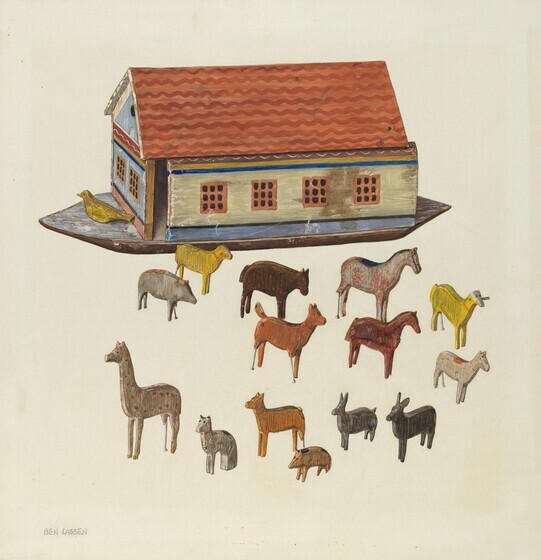 Noah's Ark with its many animals has been a favorite toy of children for generations. This example was probably made by a Pennsylvania German craftsman about 1835. The colorful ark consists of pieces of pine glued together. It has one sliding panel to let the animals go inside. 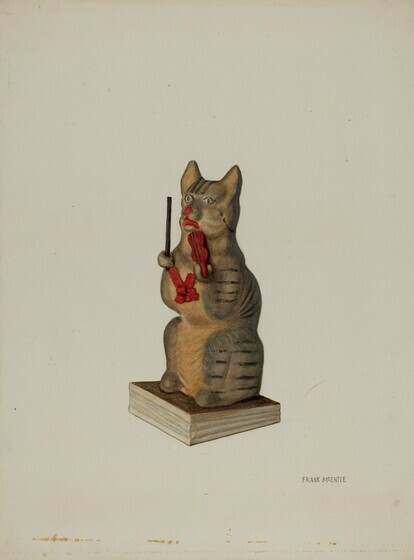 Fifteen animals are whittled from pine and painted in polychrome oil colors. The ark is decorated with a painted and stenciled design in mat polychrome. Noah's Ark was known as "Sunday toy": children were not allowed to play with most toys on Sunday, but Noah's Ark was an exception because of its biblical subject matter. Vehicular toys record the history of transportation in the United States. This is a miniature covered wagon, pulled by oxen. It imitates the primitive oxcarts in general use in the 1860s and 1870s and was made by an unknown pioneer settler near Stoughton, Wisconsin. The model is hand-carved of pine; the covering of the wagon is linen. The production of toy locomotives and toy trains was eventually extended to comprise an entire railway system in miniature. 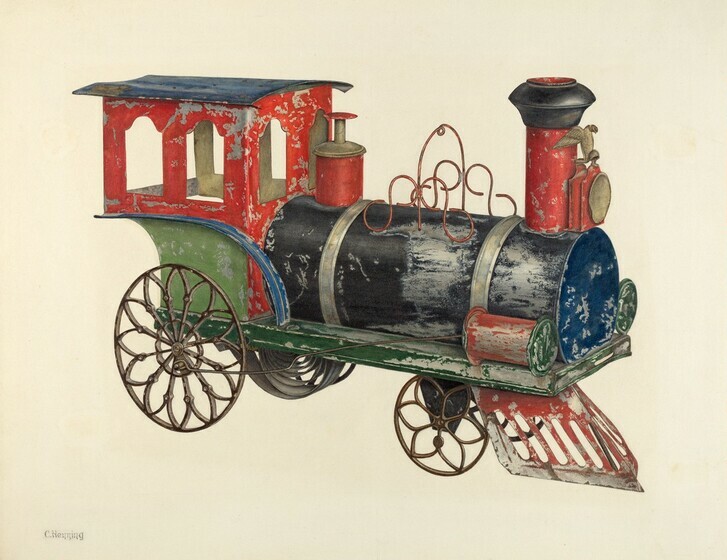 This locomotive and tender are made of wood and date from about 1850. Like its real counterpart of the day, this model had a name, The Fabyan. The original engine ran on the mountain division of the Boston and Maine Railroad from Concord, New Hampshire, to the White Mountains during the period of about 1850 to 1860. 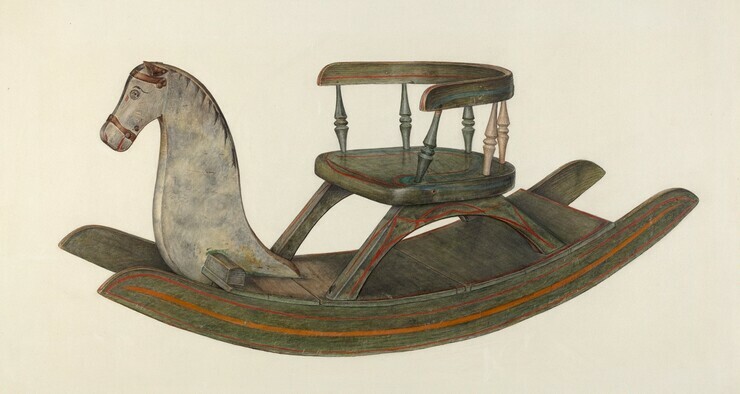 Ship models appeared frequently as children's toys; this one of hand-carved, painted wood is mounted on wheels to function as a pull toy. A particularly colorful and charming example, it dates from the early nineteenth century and is of Pennsylvania German origin. 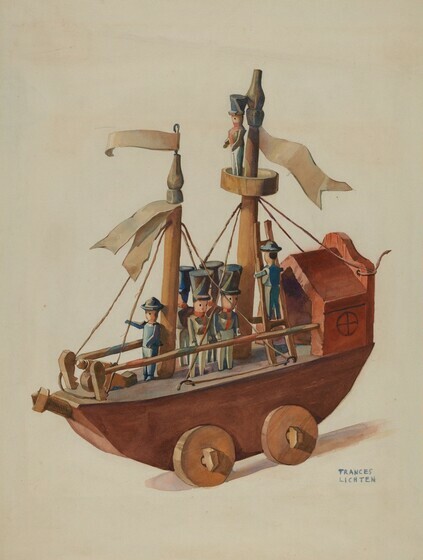 The model imitates a warship, and the figures of soldiers are appropriately costumed. With the introduction of tin toys about 1840, more complicated methods of animation were developed. 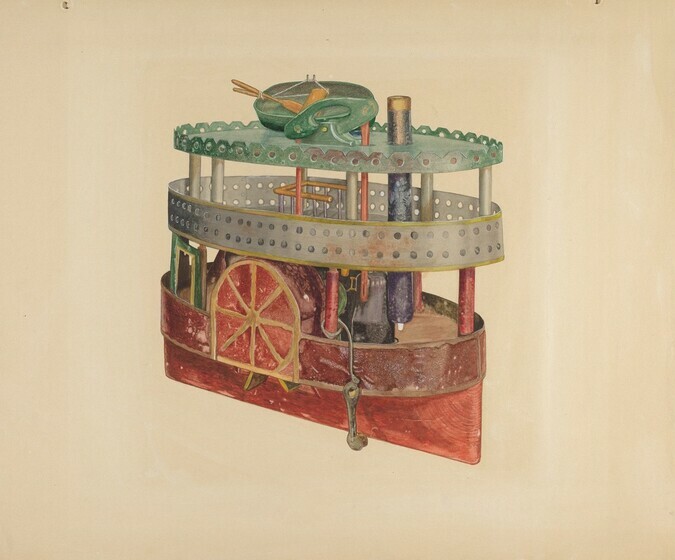 This brightly painted model of a side-wheeler, made of both wood and tin, has a windup mechanism that turns the paddle wheels. 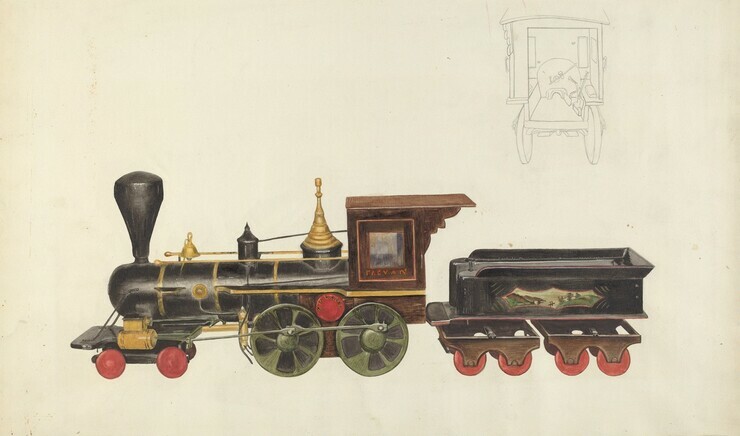 This locomotive is made from tinned sheet iron painted with oil colors and touches of gilt; it is fitted with a clock spring for propulsion. Clockwork mechanisms reached a peak in the twenty-five years following the Civil War. Locomotives were among the most popular clockwork toys. 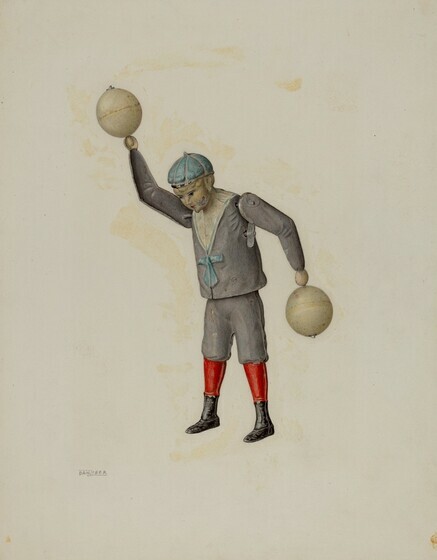 This toy dates from the third quarter of the nineteenth century. The cowcatcher in front, the eagle on the headlight, and the broad funnel characterize an early stage in the development of the American locomotive. A bell (now missing) was originally suspended from the scrolling frame arched across the top of the boiler. The locomotive runs on four cast iron wheels. In place of spokes, the wheels have ornate tracery. 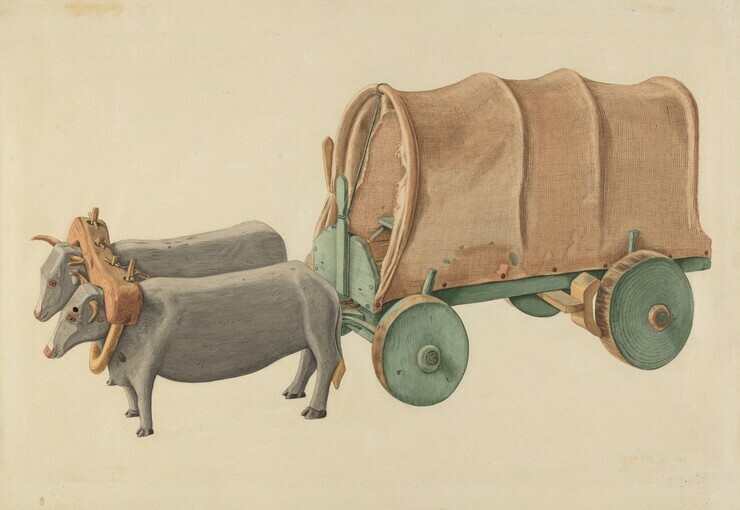 This milk wagon is made from a combination of materials: the horse and figure are plaster, the wagon is wood, and the large milk cans and dipper are tin. The wagon dates from 1870. Before that time, milk was delivered from house to house by farm wagons. 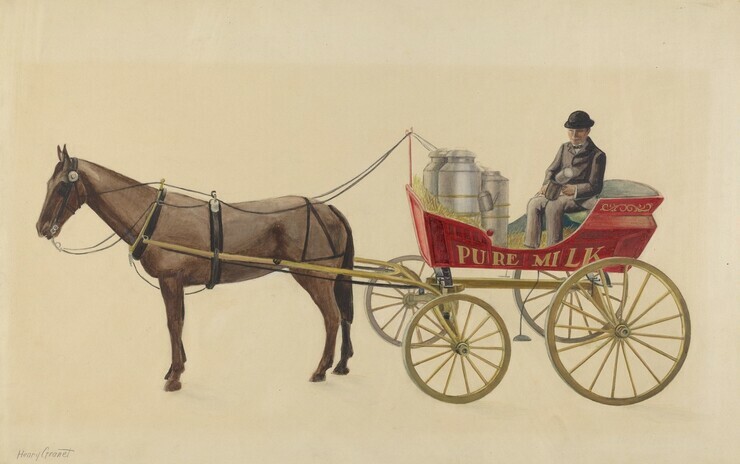 The Lake Wagon Company built the first vehicle to be used exclusively for milk delivery in New York City. This type of wagon then remained in general use until it was replaced by the closed wagon. Milk was dipped from the large cans into pitchers brought to the driver by housewives. 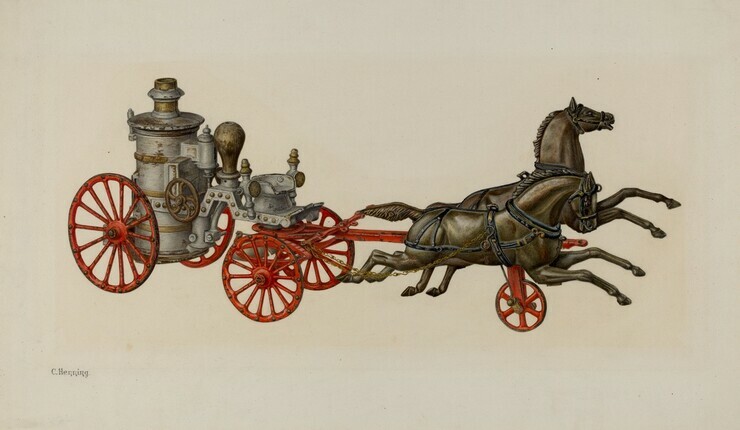 This toy model is an elegant and meticulous example of a nineteenth-century horse-drawn fire engine. The engine consists of a vertical cylindrical boiler at the back mounted on two pierced wheels. Cast iron was used for this model. While cast iron had been used earlier in the century for some toys and for parts such as wheels, miniature vehicles made entirely of iron did not appear until the 1880s. The toy was made between about 1885 and 1900 by the Ives Company of Bridgeport, Connecticut, a pioneer toy maker whose products are considered by collectors to be among the finest made. The name "Phoenix," cast in relief on the face of the door at the back of the boiler, was frequently used by Ives to identify its toys. Miniature rooms are among the choicest items in the eyes of collectors. 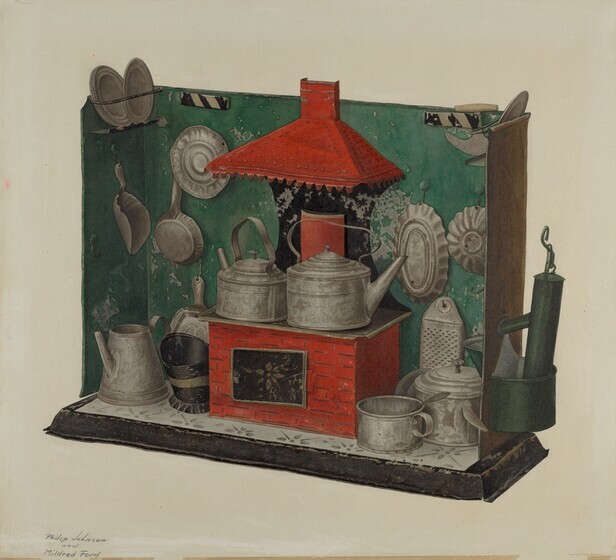 Here is a kitchen, only ten inches high, made of tinned sheet iron. One wall has been entirely omitted, as in a doll's house, to allow a complete view of the interior. A red-painted stove and hood are on the back wall, and a working pump is on the side wall. Some kitchen utensils are on the stove and floor; others hang on the three walls from hooks or are placed on racks. This hollow, articulated, or jointed, figure of a boy illustrates the rather complicated animation that could be produced with spring mechanisms. The windup key is located on his left side; it is attached to a spring inside the body. As the spring releases, the arms revolve. Simultaneously, the upper part of the figure, which is articulated at the waist, moves from side to side. The combined actions of arms and body move the figure around on its feet. The figure, painted with oil colors, dates from the late nineteenth century. Toy makers did not ignore children's appreciation of sound. Many toys incorporated a sound device of some sort, and in certain cases even musical notes were played. Toys like this bell cart of about 1860 were a special delight for children. Such objects, made from metal, combined sound with the old pull toy system of motion. In this case, a cast iron clapper strikes inside the bell as the toy is pulled along by a string. The cart consists of two cast zinc wheels with pierced designs of repeated heart shapes; the bell between is attached to the round iron axle. The bell is fashioned in two halves, of nickel-plated brass. 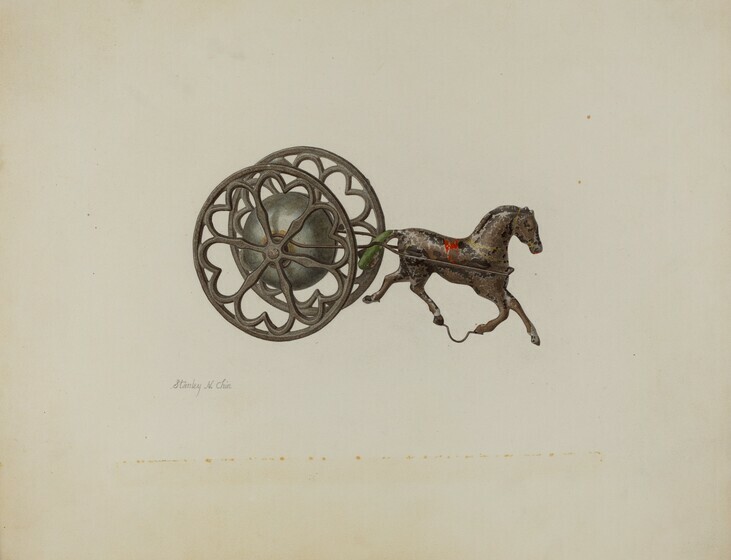 The horse is die stamped from two pieces of tinned sheet iron and soldered together. 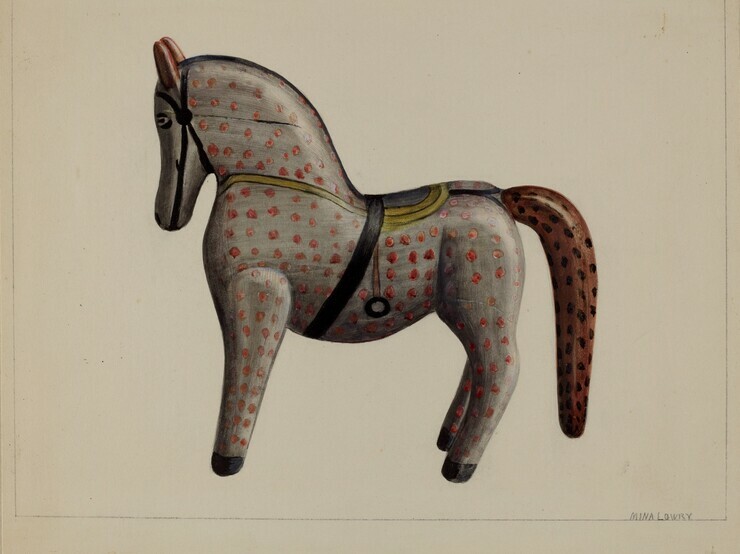 Traces of paint indicate the horse was originally painted black and decorated with touches of oil color. Spring or "clockwork" mechanisms were sometimes used to produce sounds in toys as well as to make them move. 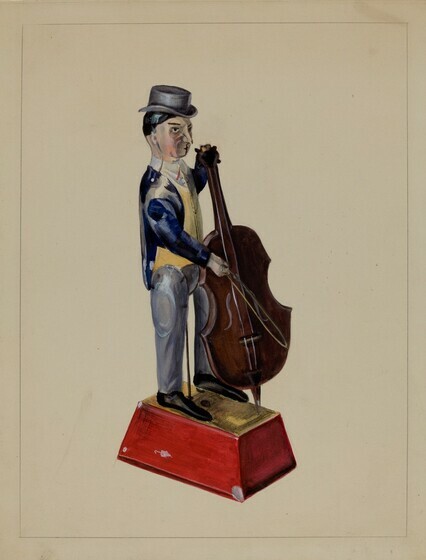 Music boxes were operated by this type of action, as is this mechanical figure of a man with a cello. When the toy is wound, the musician nods and moves his bow. The toy, dating from the late nineteenth century, plays an old-fashioned dance tune. Another kind of toy that emitted a sound was the squeak toy. An example is this kitten holding a fiddle. Such toys were made in a wide variety of birds and beasts. The figure is mounted on a small bellows which, when depressed, produces a sound suggestive of the animal's natural call. Perhaps the most avidly collected toys of all are mechanical banks. Simple cast iron banks with no animation were first manufactured just after the Civil War. With the development of spring mechanisms, many intricate and ingenious models appeared. Mechanical banks flourished between about 1870 and 1910. 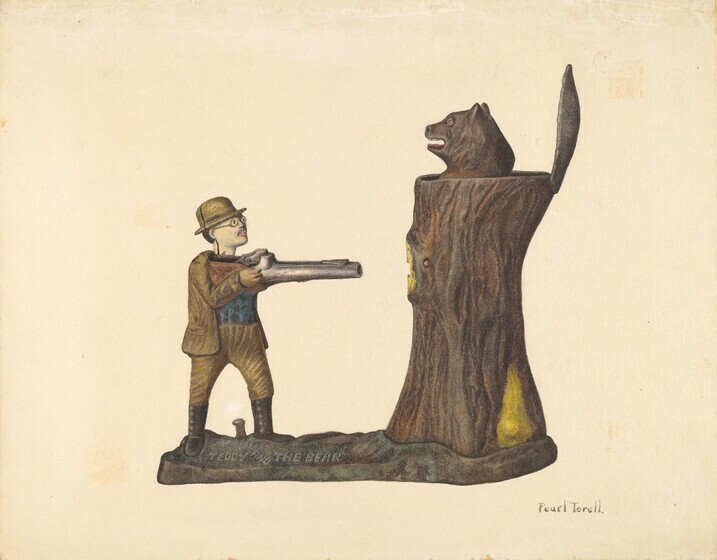 In this example, dated 1906, a coin is placed in the gun; when the lever is pressed, the coin is shot into a slot in the tree trunk and the bear's head springs up. The toy is derived from a famous event: Theodore Roosevelt, on a hunting expedition in Mississippi, refused to shoot a bear cub. The cartoonist Clifford Berryman was present and immortalized the incident in the next day's newspaper; thus, the "Teddy bear" was born. This bank was made by the Steven Company Iron Foundry of Cromwell, Connecticut. The mechanical bank had a special purpose as a child's toy: it made saving fun; thrift was turned into a game. The spring and lever action was well suited to a wide range of subjects. 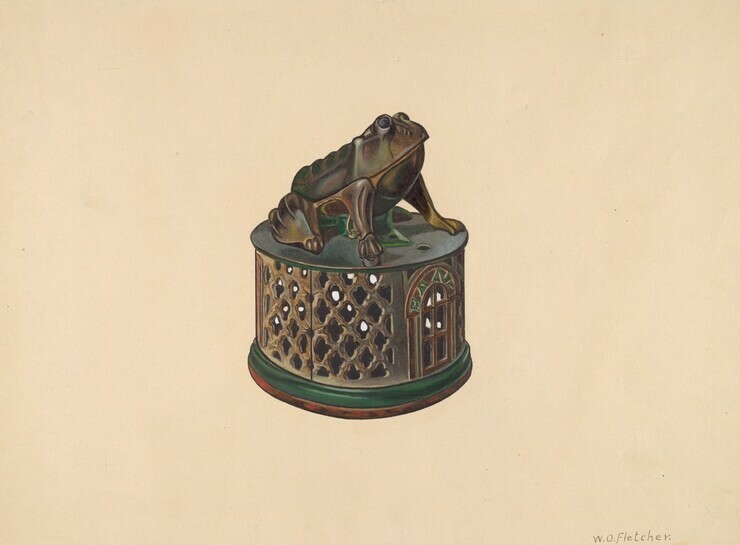 The bank shown here consists of a bullfrog sitting on a cylinder whose walls are pierced in a latticework design. The frog's right front foot rests on a spring; when the foot is pressed down, the frog's eyes roll and its lower jaw opens to receive coins. Foundries produced mechanical toy banks of cast iron by the millions between about 1870 and 1910. This piece was issued a patent on August 20, 1872. Toy makers have found numerous ways of animating their products, and puppets, activated by sticks or strings, are perfect examples of toys in motion. 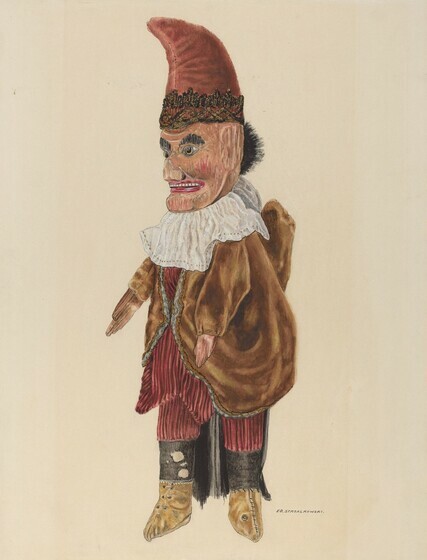 This is Punch, the villainous hero of the English puppet play, Punch and Judy, popular for a time in America. Dated about 1870, Punch has a carved wooden head and hands, fur wig, and an elaborate costume of velvet, corduroy, and cotton. The puppet is manipulated by means of a stick that extends into the head. The repertoire of puppets is an extensive one and includes many characters and animals. 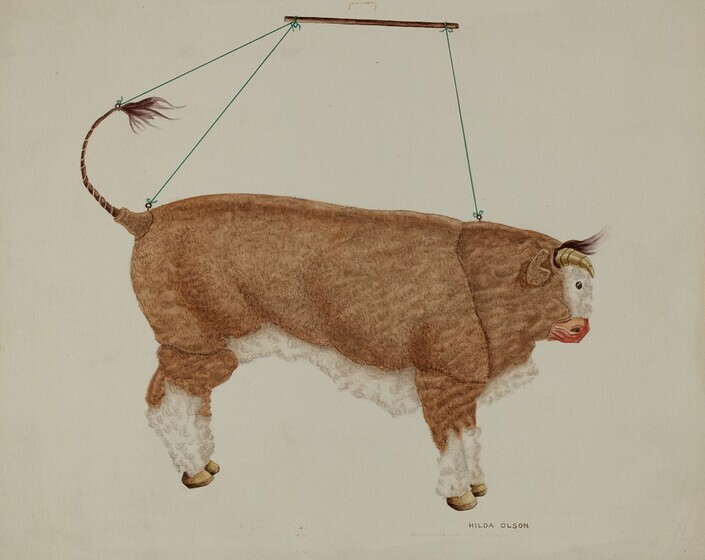 This bull puppet of 1890 is particularly appealing. It is made of a cloth with a furry texture. The strings for operating the puppet are clearly visible here. Puppets have a long history, beginning as articulated stick figures in ancient Egypt, India, Greece, and Rome. During the Middle Ages, puppets were used in miracle plays. And in early America, puppet shows provided entertainment in remote frontier areas. Doll furniture and accessories must be included among the toy replicas of the adult world. 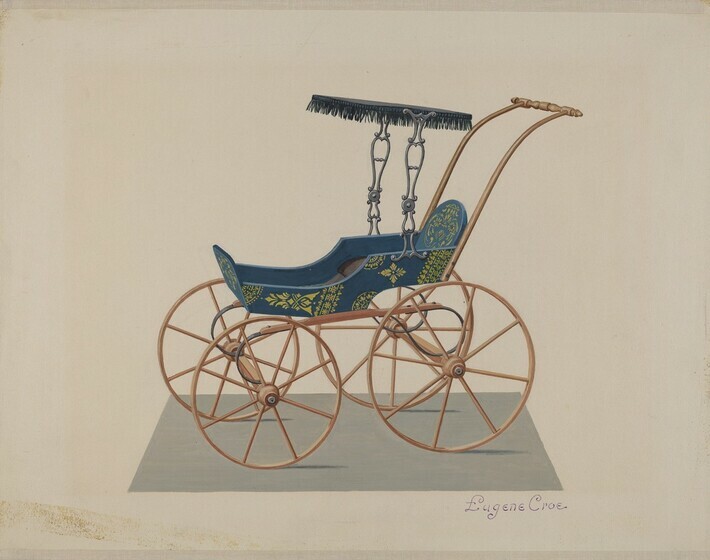 This doll buggy, of about 1867, is made of wood and is styled like a cabriolet, or horse carriage. The hood, or calash, is fringed. 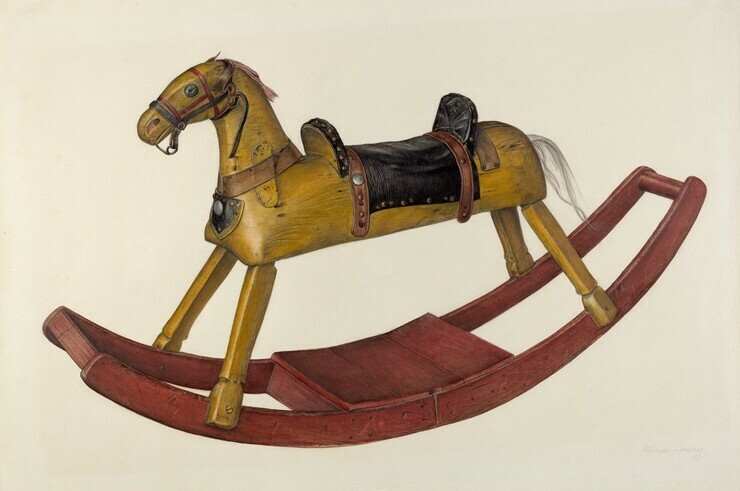 This doll's sleigh of about 1887 has painted decorations similar to those found on children's sleds of the period. It is wood with metal wire runners. The lining is blue velvet. This is a child's sled made of pine and poplar wood with oak struts. 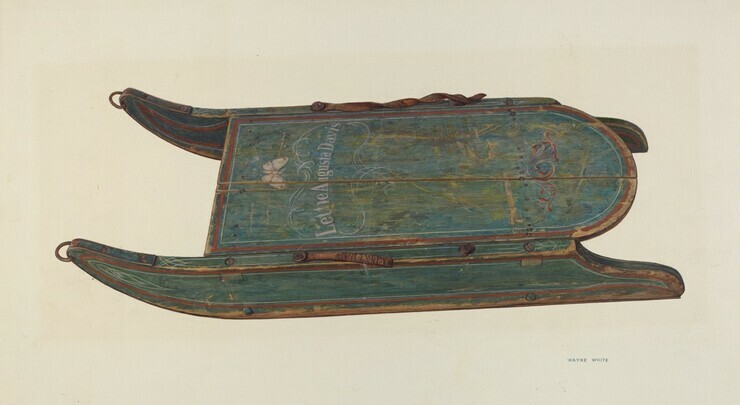 The sled is painted and includes a butterfly motif in white. 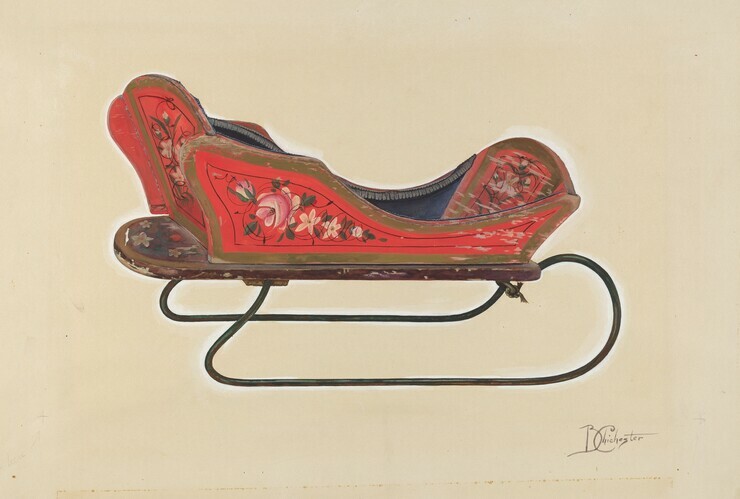 It must have been made for a girl, since the name "Lettie Augusta Davis" is painted on the top in white letters, but such coasting sleds were usually intended for boys at that time. The sled was made in 1874 by Carpenter Davis.